Shaking up the nascent market for electronic books for the second time in two months, Amazon.com will begin selling e-books for reading on Apple's popular iPhone and iPod Touch. Starting Wednesday, owners of these Apple devices can download a free application, Kindle for iPhone and iPod Touch, from Apple's App Store. 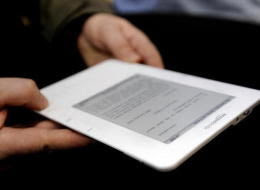 The software will give them full access to the 240,000 e-books for sale on Amazon.com, which include a majority of best sellers.